Mailed 1/24/19 to Subscribers. Allow 6-8 weeks for USPS delivery. Eternal War - Chechnya, 1994-2009: Chechnya declared its independence after the collapse of the Soviet Union. 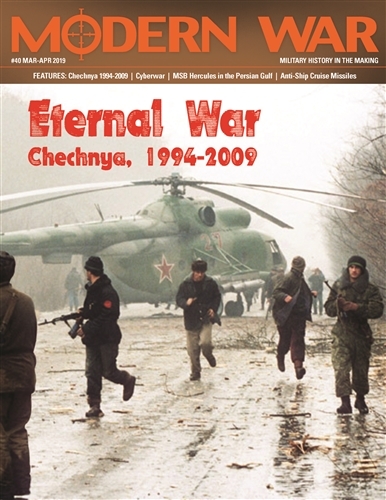 Russian forces invaded in 1994, sparking a nearly two-decade long conflict. The Geopolitics of Cyberwar: Cyberwar is an increasingly central feature of 21st century military operations, with state, non-state, and trans-national powers as players. MSB Hercules in the Persian Gulf: The growing threat of Iranian attacks on oil tankers in the Persian Gulf during the Iran-Iraq War brought the US Navy to the region. Lacking purpose-built vessels for a shallow-water war, the US Navy improvised two civilian barges to counter the threat. Anti-Ship Cruise Missiles - An Evolving Threat: Anti-ship cruise missiles have changed the nature of naval warfare. From their humble beginnings in World War II, they now utilize modern technologies that allow them to be used from air, land, or submerged platforms.